Roundtable Contributors: Elizabeth Caran (Outlander Travel), Estelle Hallick (This Happy Place), Eric Hoffman (Netmongrel), Alan Mize, Melissa Sue Sorrells Galley (Mouse on the Mind), Blake Taylor (BlakeOnline.com), Andrew (Disney Hipsters Blog), and yours truly. It has been a slow week in the "community," especially where parks are concerned. But, hurrah! We do have some fabulous extra-curricular Disney news! 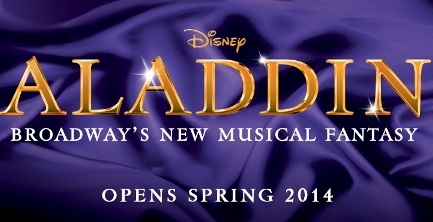 A stage adaptation of the 1992 animated classic Aladdin is set to debut on broadway in 2014! Probably making its run at the New Amsterdam theater, current home of Mary Poppins, this new show will be loosely based on a similar truncated version at Disney California Adventure. While not our favorite attraction at the park, by any means, we were surprised at how well it has held up after ten years of continuous shows. Out of all of the 1990's comeback era Disney films, this one makes the most sense as a broadway musical. It has terrific songs, lovely exotic setting, and plenty of legitimate humor. (where, say, Beauty and the Beast or Little Mermaid did not) I'm super excited to see how this plays out. Disney Broadway news has been flying high lately, even with the Sunday closing of Peter and the Starcatcher. (The play will reopen Off-Broadway at the New World Stages on March 18.) That’s right! Disney Theatrical officially announced Aladdin the Musical will be making its home at the New Amsterdam Theatre in 2014. A new script, new tunes, and set design will first seen in Toronto for a pre-Broadway tryout in the fall of this year. As exciting as a new musical is, I’m hoping Disney is considering past blunders (The Little Mermaid) and putting their thinking caps on (ala The Lion King) when it comes to presenting their first big budget show in a few years. (Newsies only cost a few million compared to the $12 million budget of Aladdin.) With such great songs and a story that encompasses romance, comedy, and friendship, I’m truly hoping for a hit. Food and Beverage and Flowers... Oh My! 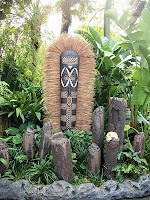 It was announced that the 2013 Epcot International Flower & Garden Festival will feature edibles for the first time in the 20 year running of the event. According to the Orlando Sentinel there will be a dozen eateries throughout World Showcase with regionally inspired foods. Of all the offerings mentioned, one that many Disney fans will find particularly intriguing is a Dole Whip with Spiced Rum. Once again, a Dole Whip with Spiced Rum. This mash-up of the Flower/Garden and Food/Wine festivals sounds like a great thing to me. A Dole Whip and some outdoor dining are perfect for admiring the transformation that overtakes Epcot during the Flower & Garden Festival. A simple search of "Limited Time Magic" on the Disney Parks Blog makes clear the differences that Disneyland and Walt Disney World have partaken in this celebration thus far. While each resort has indeed lived up to its promise of bringing new magic into its Parks for a limited time only, the qualifications for that magic seem to be on vastly different scales. Disneyland has seen elaborate festivals, small shows, and even the return of the legendary Golden Horseshoe Revue. The only truly exciting offering for WDW thus far came this week, with vintage characters returning to the Magic Kingdom for exclusive photo opportunities, from the semi-regular (like Pinocchio) to the rarest of the rare (like Ludwig Von Drake... !). Granted, it's still January and there's a lot of 2013 left for WDW to prove this statement wrong, but Disneyland has definitely gotten the better end of the deal here. However, it's interesting to note that the majority of Disneyland's Limited Time Magic events so far are nothing new. They happen every single year, but are just more heavily promoted this year to tie in with the promotion. Disneyland regularly plays host to smaller, shorter holiday events like Mardi Gras and Lunar New Year, while WDW hardly ever recognizes anything less than a major holiday. That being said, it brings to light a fascinating possibility: could Limited Time Magic be testing grounds for WDW to implement more intimate, Disneyland-esque events? 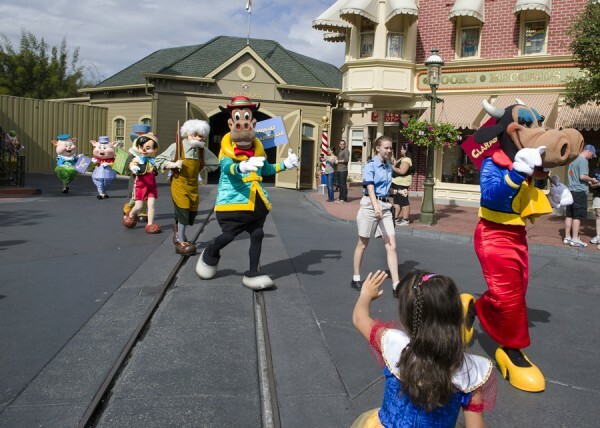 The characters from this week's Long Lost Friends lineup are pretty close to the characters my family met in Town Square in 2003 before they were "long lost." Could the success of initiatives like this encourage WDW to have more randomly selected character greetings throughout the Parks like it once did, like Disneyland still does? It is certainly too early to wager any guesses to these questions, but I think they're worth considering. Limited Time Magic might just be the start of a new face of WDW entertainment. This week, at the Sundance film festival, Escape From Tomorrow has created a bit of a buzz. It's not a Disney movie at all, but rather a film that was created in both the Florida and California parks without the knowledge or permission of Disney. According to Slate, even guests who might have passed by during filming may not know they are in a movie. On top of that, the movie is not necessarily the sort of story Disney wants associated with their brand. It will be very interesting to see how Disney handles this, or even if they have to handle it at all. As the article points out, with the power of Disney's brand and influence simply existing, it's unlikely most distributors would pick up the film. I must admit I am intrigued by it, however. The parks make an excellent setting for drama of all sorts, but especially drama around a family vacation. National Lampoon danced around it in 1983 with their infamous movie about the journey to Walley World. We know that some fantastic stories (both true and fiction) could be set in and around our favorite vacation destination. Sunday February 2nd isn’t just any Sunday, it’s Super Bowl Sunday. Even though my favorite team (Go Skins!) has been knocked out of the playoffs, I’m still looking forward to getting together with friends and family and watching the game. Now, since I’ll be at home, my plans are pretty easy. However, for those of you down at Walt Disney World that week, it may not be as easy for you. Sure, there are plenty of sports bars in Orlando that you could go to, but if you want to stay on property, your options are somewhat limited. Most of the resorts will probably show the game in some public setting. Generally, that’s the pool area. There’s always the ESPN Club on the Boardwalk. They’ve got great bar food and tons of televisions so I’m sure you’d have fun there. But this year, Disney is offering up something new. Over at the newest addition to Downtown Disney, Splitsville Luxury Lanes will be throwing a Super “Bowl-ing” Party. With 40 flat screen TV’s in the building, it would be nearly impossible not to see the game. Plus they will be having complimentary appetizers and an open bar. There are a few things worth mentioning here. This event is for guests 21 and over, and there is a $75 cover charge which sounds like a lot, but part of the proceeds of the event go to the Clean the World Foundation which donates soap and shampoo products to impoverished nations around the world. So, not only do you get to watch the game on 40 televisions, eat all of the appetizers you want, and drink enough rum drinks to make Captain Jack Sparrow jealous, you also get to support a local charity which helps those in need. So, if you’re at Walt Disney World the weekend of the Super Bowl and you don’t already have plans, check out the Super Bowl-ing party over at Splitsville Luxury Lanes. Yesterday, Disney Parks Blog officially announced that A Pirate’s Adventure: Treasures of the Seven Seas is coming our way, and I'm looking forward to playing it in Magic Kingdom's Adventureland. Of course, I miss the Adventureland Challenge—the CM-hosted treasure hunt around the jungles of the world—but this seems like an even-more interactive version of those old time fun times. Let's shoot off some cannons and be answerin’ to no man or stinkin’ go’ernment. Plan For As Soon As It Comes Out: Get my face painted at the Pirates League, and then raid the Kingdom!! Care to join me? A pirates life may be a wonderful life, but we’ll find out for sure one way or another when the Magic Kingdom unveils A Pirate’s Adventure: Treasures of the Seven Seas. The game will include a talisman which helps guests complete five missions, grab treasure from the Seven Seas, and fight off the foes of Captain Jack Sparrow. This makes the fourth interactive game launched in Walt Disney World, behind Agent P’s World Showcase Adventure, Sorcerers of the Magic Kingdom, and the recently announced Wilderness Explorers coming to Disney’s Animal Kingdom. While I would love to fight alongside Witty Jack, I am greatly concerned about the saturation level of Adventureland. The land has always been an intimate, small land filled with great nooks and crannies. To see the cramped nature of this land you need look no further than Fire Portal for Sorcerers of the Magic Kingdom, tucked away along a walkway in a cabinet that makes it very difficult for other guests to maneuver by. I’ve seen some of the Seven Seas locations and while there does appear to be more space for each of these ports, long lines and Adventureland’s everyday congestion do have me worried. My second concern is when does Disney’s Hollywood Studios get its interactive game? I’d love to see a Star Wars game, it doesn’t really work to turn loose a Stormtrooper on the Hollywood Tower Hotel. The Muppets, however, who already have a great game aboard the Disney Fantasy known as The Midship Detective Agency, are primed for a run at a Great Muppet Caper in the land of Hollywood.